Returning to the Playhouse Studio, a space reopened in 2011 by her “Swallowing Dark”, Lizzie Nunnery here combines her stark theatrical writing style with another strand of her work, as singer-songwriter, but Narvik is not to be confused with a musical. Nunnery appears onstage, along with composer/musicians Vidar Norheim and Martin Heslop (Bright Phoenix), and all three engage in the stage movement whilst providing the soundscape for the play. There are a small number of folk-inspired songs, reminiscent of sea shanties, amidst a sea of sound and colour that seeps out of the woodwork of the stage, as they use a variety of found objects as well as traditional instruments to create their music. 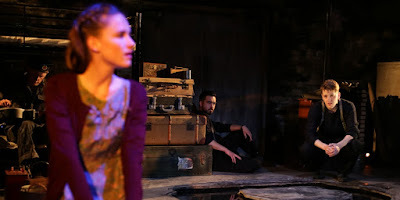 Narvik is big on atmosphere, and Richard Owen’s lighting nuances a detailed set by Maeve Black, which makes use of every square inch of the Studio’s performance space, ropes weaving out over the heads of the audience. The warp and weft of the story are the lives of Jim, a Liverpool fisherman and Elsa, an Oslo schoolteacher, which become entangled with those of Kenny and Lucya. The play opens with Jim, at 90, who falls and lies calling for help. As his consciousness drifts we follow his memory back to 1940, when Jim finds himself in Norway working as a warship radio operator with Kenny and meets the enigmatic Elsa. So we are reminded of the involvement that the town of Narvik had in WWII, through the lives of two people brought together and torn apart by the conflict. He may not have a girl in every port, but Jim’s romantic tale is far from straightforward. Joe Shipman delivers a powerful performance as Jim, successfully navigating the journey from youth to old age and back several times throughout the play’s 70 minutes, although his opening scene is just a little awkward in the writing. Lucas Smith’s bluff, pragmatic Kenny is a perfect foil to Jim’s brittle character and Smith does a good line in smouldering behind heavy brows. Nina Yndis, by turns coquettish and knowing, has tremendous presence on stage, both as Elsa and as Jim’s Russian brief encounter Lucya. Lizzie Nunnery pays tribute to the Battles of Narvik through the wartime memories of her grandfather, and Director Hannah Tyrrell-Pinder finds both anger and tenderness in Nunnery’s words. Narvik is produced by Box of Tricks theatre in association with Liverpool Everyman and Playhouse and it plays at the Studio until Saturday 19th September.